AFRICA/SOUTH SUDAN - The opening of the Vatican diplomatic Seat "warms the hearts of the victims of war"
The Bishops: "It is urgent to look for a new agreement if true peace is desired". A missionary says: "father, why did God allow me to be born in South Sudan?" Juba (Agenzia Fides) - "On behalf of the Catholic Church in Sudan and South Sudan, as well as all the people of Southern Sudan, I express my sincerest gratitude to the Holy Father. The step taken by our Pope Francis warms the hearts of the victims of war, trampled in these nations, and symbolizes the friendly bond between South Sudan and the Holy See": says the Bishop of the diocese of Tombura-Yambio, Msg. Barani Eduardo Hiiboro Kussala to Agenzia Fides, welcoming the decision to provide for the presence of a diplomat of the Holy See in Juba. To this end, Pope Francis gave his consent to the appointment of Mgr. 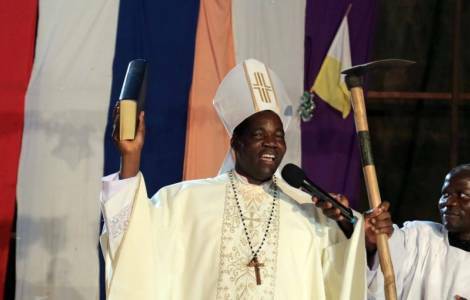 Marco Kedima, of the diocese of Kakamega in Kenya, as Counselor of the Apostolic Nunciature in South Sudan. "The opening of the permanent seat demonstrates without doubt how the Holy Father has South Sudan close to his heart" continues Mgr. Kussala, who is also President of the Sudan Bishops' Conference. "When South Sudan gained its independence in 2011, the Holy See sent His Exc. Charles Balvo of Kenya as Apostolic Nuncio at the service of our Country. In our country - the Bishop points out - there is great attention toward Catholics. The Government of South Sudan has always been committed to safeguarding the well-being of every religious community in the country, including the Catholic faithful. I hope this move and the excellent relations between both parties continue to grow". "Pope Francis continues to do great things for us, and we are truly grateful to him as well as being his great admirers: he teaches us to cross our borders with love, reaching all of humanity. He has managed to win the hearts between religious and even non-believers. Since the first day of his Pontificate, he has never stopped praying for us, he has planned a pastoral visit and now he has opened the Consulate", says the note sent to Fides. ASIA - Joint appeal of the Directors of the PMS of India and Pakistan: "Dialogue is urgently needed for the common good of our peoples"